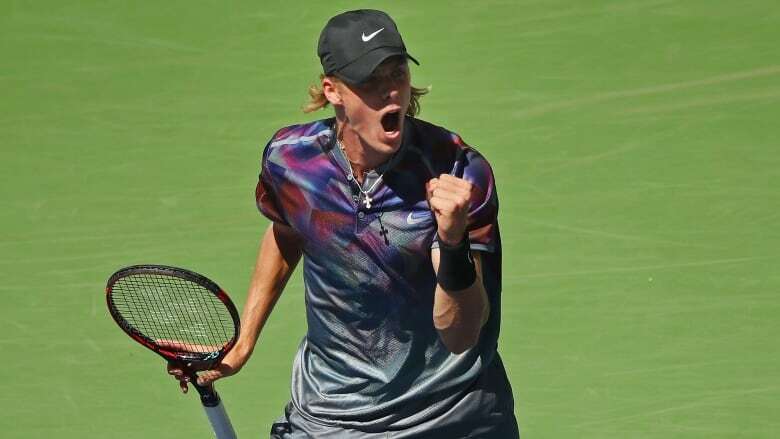 Canada's Denis Shapovalov has advanced to the fourth round of the U.S. Open after British opponent Kyle Edmund retired with an injury. So, Denis Shapovalov, do tell: It can't really be the case that 18-year-olds like yourself never get tired, right? "No, it's true. We don't," the Richmond Hill, Ont. resident joked Friday after becoming the youngest man to reach the U.S. Open's fourth round since a 17-year-old Michael Chang in 1989. "It's been a long ride," said Shapovalov, who was born in Israel to Russian parents and moved when he was a baby to Canada. "It feels like I have been here a month already." "It's never great to win this way," Shapovalov said. "Hopefully, it's nothing too serious." Neither he nor Schwartzman had ever been to a major's fourth round before, nor had another of the afternoon's winners, 35-year-old Paolo Lorenzi of Italy, who actually began his Grand Slam career with an 0-13 record. "That's right: A few surprises and lots of withdrawals," Schwartzman noted. "This is the moment to take advantage." "It's kind of a transition time for the ATP," Shapovalov said, "but I think there is a lot of talent coming up." At the time of Cilic's departure, the highest-seeded man remaining in that half was No. 10 John Isner, the top-ranked American man, who was scheduled to face No. 23 Mischa Zverev on Friday night. That was to be followed in Arthur Ashe Stadium by five-time major champion Maria Sharapova against 139th-ranked U.S. wild-card entry Sofia Kenin. "The month of August," Shapovalov said, "has been absolutely life-changing for me." He is a crowd-pleaser, someone who plays a fluid, aggressive game featuring a big lefty forehand and a one-handed backhand — and he shows plenty of emotion while he's at it. He also plays wearing a baseball cap with its band tightened to an extreme degree, drawing plenty of attention on social media. "I have a small head," he said with a smile. "It's just kind of become a little bit of my trademark." His next opponent is No. 12 Pablo Carreno Busta, a Spaniard who earned a spot in the U.S. Open's fourth round for the first time by easily eliminating Nicolas Mahut 6-3, 6-4, 6-3. Carreno Busta will be the first man at any Grand Slam tournament in the Open era, which began in 1968, to face four qualifiers. Venus Williams is into the fourth round of another major after beating Maria Sakkari of Greece 6-3, 6-4. The No. 9 seed reached the second week for the seventh straight major, the longest active streak in women's tennis. It's the first time since 2010 that she reached the fourth round in every major. Her victory came hours after ESPN reported her sister Serena had given birth to a baby girl. Maria Sharapova defeated American Sofia Kenin 7-5, 6-2 to reach the U.S. Open round of 16. But Sharapova eventually prevailed on power, ripping 36 winners to Kenin's six. Sharapova next faces 16th-seeded Anastasija Sevastova of Latvia, who earlier downed Donna Vekic of Croatia 6-2, 6-3. Petra Kvitova delivered a sizzling performance by blowing past 18th-seed Caroline Garcia 6-0 6-4 to reach the fourth round at Flushing Meadows. Kvitova, playing in just her eighth tournament since missing five months of action after being stabbed in the hand last December, finished off the Frenchwoman within 73 minutes in Arthur Ashe Stadium, closing out the contest in style with a fine ace. "It means a lot, I really appreciate it that this time I could play again on the big stages," said Kvitova. "After everything that I have been through, it is a very happy moment for me."